I received this book to review. I have included affiliate links below. When you purchase through these links, I may receive a small commission. Thank you for supporting this site and our sponsorship of our Compassion child, Samson! I’m not a big fan of what the world thinks a “Christian” looks like these days. If you were to ask a person on the street about the character traits of a Jesus-follower, I’m afraid you would hear words like self-righteous, judgmental, and close-minded. These are ugly words and the furthest thing from the character of Jesus. This is the world in which we are raising our children. 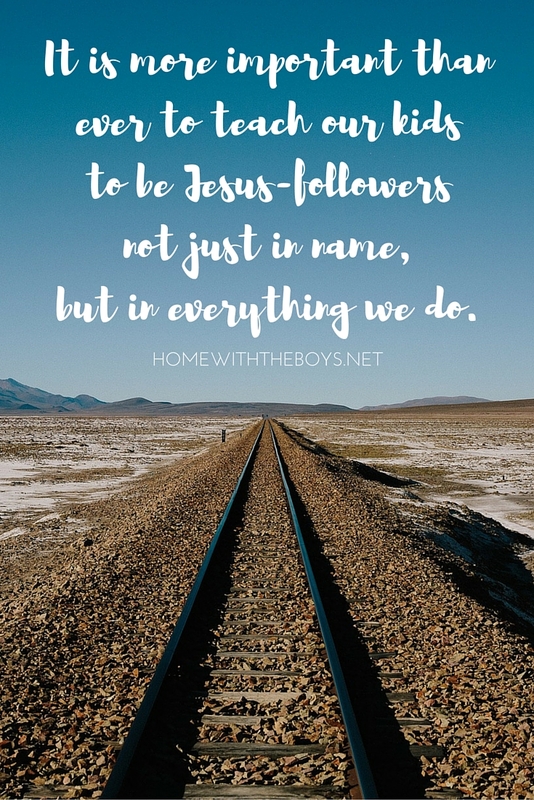 It is more important than ever to teach our kids to be Jesus-followers not just in name, but in everything we do. My character has to speak louder than any label I may claim. And I want the character of my boys to do the same. When we look at the life of Jesus, there are so many character traits for us to emulate and teach to our kids. I like to narrow down our focus when the kids are little and build upon it as they grow and mature in their faith. Jesus loved people. All people. He loved like no one ever has because He is God and God is love. When we look at the two most important commandments given to us by God, they come down to love. Love God. Love people. A Jesus follower is loving. We’ve already talked about the negative view much of the world has of Christians. Living and loving boldly in the name of Jesus takes courage. One day it might look like standing up for a classmate who is getting picked on at recess. Another day it may mean stepping out of your comfort zone to share a bible verse with someone who needs encouragement. We’re not scaling physical mountains, but sharing the love of Jesus in a hostile world most definitely requires bravery. And Jesus is the one who makes us brave! Jesus was the only perfect person to ever walk this earth, yet He was humble, even to the point of death. We live in a world where pride matters and we don’t want our pride hurt. Being a Jesus-follower means leaving our pride at the foot of the cross and walking in humility. What does humility look like for our kids? Sometimes it means putting others’ needs before our own, which goes hand in hand with loving well. It also means not always having to be “right” all the time. We have some stubborn boys in this house (they might get that from their mama), and they like to be right about things. They also like to correct someone when they are wrong. A humble person knows how to take constructive criticism, as well when to keep their “right” thoughts to themselves. If we as Christians are always pointing out what others are doing wrong, we are exhibiting pride and opening ourselves up to a big fall when someone catches us in sin. When we look to Jesus and see His grace and mercy to us even when we were still sinners, we can’t help but be humble. We can talk about all these characteristics to help our children in their walk of faith, but being a Jesus-follower comes down to one thing. We must be willing to follow what Jesus asks of us – no matter the cost, no matter what we look like. 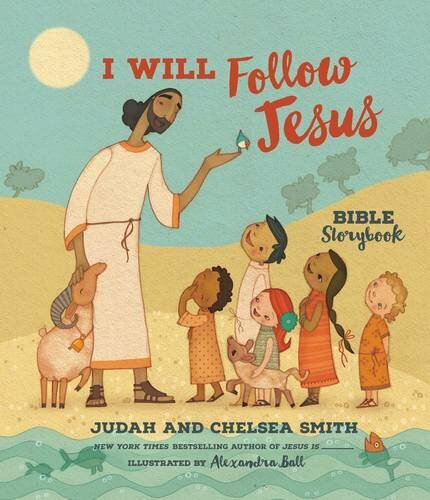 We look at the life of Jesus, as told so well for kids in I Will Follow Jesus, for how to live, but we must also pray and listen for His voice, calling us to do the work He has just for us here on earth. Invite your kids to live out these characteristics, open their heart to the call of Jesus in their life, and follow Him! GIVEAWAY: I’m giving away three copies of I Will Follow Jesus to you lovely people! Just use the widget below to enter! I think I want my kids to be most like Jesus in the way that He teaches us to be loving; not only in words, but in action and truth! I agree that we need to demonstrate the characteristics of Jesus and it’s something we try to do everyday. I would love a copy of this book as a resource to assist with that. Teaching our children to be loving to all others is so important. I love the concept of teaching our children to be Jesus followers. I want my daughter to be brave! It’s something I never thought of as a characteristic of a Jesus follower – but goes with my constant prayer for boldness, as I struggle to speak up when needed. Raising four kids and being in ministry, I want my kids to develop all these characteristics. But to pick one today, I would say to be humble. The word “brave” is the one I really want to focus on. At bed time, I make up stories for my son where he stands up for someone at the playground or elsewhere. Justice is something I want my boys to always fight for! Thanks for sharing. The book looks great! Brave & humble…so good. I am raising up “preachers kids”!! I definitely want them to follow all aspects of Jesus’s character – I am primarily focusing on love and being others-minded. If we continue to focus on caring for others then we will focus less on ourselves! Great blog post! I do hope and pray that my kids continue to be Jesus followers. My prayer right now for my kids is that they live with honest integrity – that they do not hide who they really are, but recognize that we are all sinners in need of grace! Loving……how could you better represent Jesus in the world?